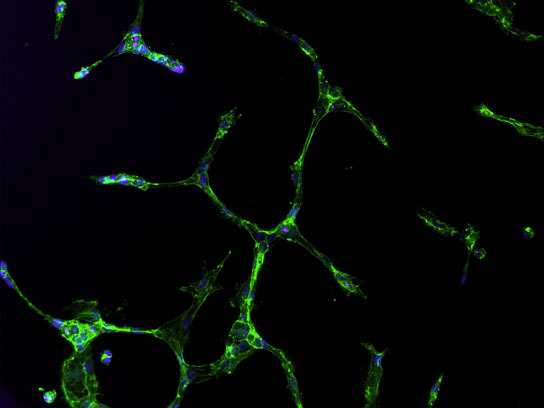 This image shows cells derived from amniotic fluid forming capillary-like networks when treated with specific growth factors and grown on a soft biological surface. Research at Rice University aims to use stem cells from amniotic fluid to repair congenital heart defects with living tissue that is a genetic match for a newborn. In an effort to help infants born with congenital heart defects, a team of researchers at Texas Children’s Hospital and Rice University have transformed stem cells from amniotic fluid into cells that form blood vessels. By working with cells that can form from blood vessels, they hope to be able to create the technology necessary to replace defective tissue with beating heart tissue. 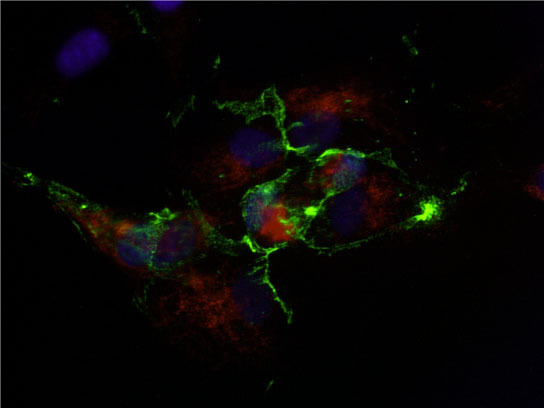 Cells derived from amniotic fluid display a shape and typical cell-cell connections indicative of endothelial cells, which form blood vessels, after treatment with specific growth factors. Researchers at Rice University are working with amniotic stem cells with the goal of growing living tissue that matches infants born with congenital heart defects. Be the first to comment on "Working to Save Infants, Researchers Transform Stem Cells into Cells that form Blood Vessels"